Eukaryotic cells respond to DNA damage by activation of DNA repair, cell cycle arrest, and apoptosis. Several reports suggest that such responses may be coordinated by communication between damage repair proteins and proteins signaling other cellular responses. The Rad51-guided homologous recombination repair system plays an important role in the recognition and repair of DNA interstrand crosslinks (ICLs), and cells deficient in this repair pathway become hypersensitive to ICL-inducing agents such as cisplatin and melphalan. We investigated the possible role of the Rad51-paralog protein Xrcc3 in drug resistance. Xrcc3 overexpression in MCF-7 cells resulted in 1) a 2- to 6-fold resistance to cisplatin/melphalan, 2) a 2-fold increase in drug-induced Rad51 foci, 3) an increased cisplatin-induced S-phase arrest, 4) decreased cisplatin-induced apoptosis, and 5) increased cisplatin-induced DNA synthesis arrest. Interestingly, Xrcc3 overexpression did not alter the doubling time or cell cycle progression in the absence of DNA damage. Furthermore, Xrcc3 overexpression is associated with increased Rad51C protein levels consistent with the known interaction of these two proteins. Our results demonstrate that Xrcc3 is an important factor in DNA cross-linking drug resistance in human tumor cells and suggest that the response of the homologous recombinational repair machinery and cell cycle checkpoints to DNA cross-linking agents is intertwined. Cisplatin is one of the most potent antitumor agents known, displaying clinical activity against a wide variety of tumors. Its cytotoxicity is mediated by the induction of DNA intrastrand adducts and DNA interstrand cross-links (ICLs). ICLs are particularly deadly because a single unrepaired ICL impairs DNA replication and translation. The repair of ICLs is thought to involve the combined action of nucleotide excision repair components, which unhooks the ICL, either initially or after strand invasion, along with the action of the homologous recombinational repair (HRR) machinery. In cycling mammalian cells, HRR is a major pathway involved in the repair of double strand breaks, which are probably produced during the ICL repair process, whereas nonhomologous end-joining is favored when recombinational substrates are not available (G1 phase of the cell cycle) (De Silva et al., 2000; McHugh et al., 2001; West, 2003). The HRR process requires the assembly of multienzymatic complexes visualized immunocytochemically as Rad51 nuclear foci. These complexes include the Rad51 paralog family members such as Rad51, Rad54, Rad51B, Rad51C, Rad51D, Xrcc2, and Xrcc3 (reviewed in West, 2003). Rad51 paralog-defective cell lines (Rad51B, Rad51C, Rad51D, Xrcc2, and Xrcc3) present similar phenotypes: spontaneous chromosomal aberrations, high sensitivity to killing by cross-linking agents, and attenuated Rad51 focus formation after exposure to ionizing radiation (IR) (Liu et al., 1998; Takata et al., 2001). Recently, similar results have been obtained in a human colon cancer cell line in which Xrcc3 was inactivated by gene targeting (Yoshihara et al., 2004). However, in these cells, Xrcc3 deficiency results in milder sensitivity to DNA cross-linking agents (2-fold) when compared with previous results in deficient hamster cells. Moreover, Xrcc3 deficiency resulted in increased endoreduplication. Rad51C is involved in at least two complexes, one containing Rad51B-Rad51C-Rad51D-Xrcc2 and another containing Rad51C-Xrcc3 (Masson et al., 2001). Rad51C and Xrcc3 may be involved in Holliday junction resolution, whereas other Rad51 paralog members may be involved in branch migration processes (Liu et al., 2004). One of the biological responses to DNA damage is to slow progression through S-phase as a consequence of activating a checkpoint. For example, following exposure to IR, cells activate the ATM kinase, which initiates a generalized response that includes the S-phase checkpoint pathway to delay DNA replication and allows the repair of DNA. In response to double strand break induction, ATM triggers two parallel cascades that cooperate to inhibit DNA replication, resulting in the S-phase checkpoint. The two parallel cascades involve ATM-dependent phosphorylation of Chk2 and Nbs1, respectively. The DNA damage-activated kinases Chk1 and Chk2 are also implicated in regulation of G2 checkpoints (Falck et al., 2002). p53 has been shown as well to be an important component of G1 and G2 arrest in response to DNA damage. The p53-responsive p21 protein inhibits cyclin-dependent kinases that drive cell cycle progression. p53-dependent p21 induction is thought to mediate G1 and G2 arrest in response to DNA. Although the IR-induced S-phase checkpoint summarized above has been extensively described, little is known about the molecular mechanisms involved in the S-phase checkpoint elicited in mammalian cells by DNA cross-linking agents. Enhanced DNA repair of ICLs produced by DNA cross-linking agents has been associated with resistance to these agents (Batist et al., 1989; Torres-Garcia et al., 1989; Spanswick et al., 2002). Moreover, increased Xrcc3 protein levels in cell lines and clinical samples correlated with DNA cross-linking agent resistance (Wang et al., 2001; Bello et al., 2002). In the present study we investigate the consequences of the Rad51-related paralog, Xrcc3 overexpression in terms of cell cycle progression, Rad51-related homologous recombinational repair, and cell survival after cisplatin treatment in the breast cancer cell line MCF-7. Our results demonstrate that Xrcc3 mediates cisplatin resistance by a Rad51-dependent mechanism and suggest that crosstalk between HRR and cell cycle checkpoints may exist. Cell Culture and Stable Transfection. MCF-7 cells were maintained as described (Batist et al., 1989). The Xrcc3 open reading frame sequence was subcloned into the pcDNA3.0 expression vector (Invitrogen, Carlsbad, CA), amplified, and stably transfected into the human breast cancer cell line MCF-7 using the Effectine reagent (QIAGEN, Valencia, CA) following the manufacturer's instructions. The transfected cells were maintained in medium for 36 h, trypsinized, and serially diluted. Single clones were amplified for 3 weeks in medium containing 600 μg/ml G418 (geneticin). Mock-transfected MCF-7 cells were obtained by transfection of the empty pcDNA3.0 expression vector. Cell Survival Assay. The cells were seeded in 96-well plates until 50% confluent and then treated with cisplatin (CDDP; 0–100 μM) (Mayne, Montreal, QC, Canada) or melphalan (MLN; 0–100 μM) (Sigma-Aldrich, St. Louis, MO). Survival was assessed 7 days after treatment using the SRB colorimetric assay described previously (Batist et al., 1989; Aloyz et al., 2002; Bello et al., 2002). The IC50 (concentration of drug) that results in 50% of control was calculated as previously described (Batist et al., 1989; Aloyz et al., 2002; Bello et al., 2002). The IC50 values represent the mean and the 95% confidence intervals (CIs) of three independent experiments. Annexin V Assay. Subconfluent cultures were treated with CDDP (0 or 20 μM), and the induction of apoptosis was determined as described before (Aloyz et al., 2004) using the Annexin V-EGF (BD Biosciences Clontech, Palo Alto, CA). Briefly, 0 to 36 h after treatment, floating and adherent cells were harvested, washed with phosphate-buffered saline, fixed, and stained following the manufacturer instructions. 7-Amino actinomycin D (BD Pharmingen, San Diego, CA) was used to discriminate apoptosis from necrosis. The cells were immediately subjected to bivariate analysis using a FACSCalibur flow cytometer (BD Biosciences, San Jose, CA). The percentage of Annexin V cells represents the mean value and the 95% CIs of two independent experiments. FACS Analysis. Subconfluent cultures were treated with CDDP (0 or 20 μM) for 1 h, and the DNA content was determined by FACS analysis using propidium iodide as described before (Aloyz et al., 2002). Cell cycle analysis was performed using an EPICS XL-MCL fluorescent-activated cell sorter (Beckman Coulter, Fullerton, CA). The percentages represent the mean value and the 95% CIs of two independent experiments. Rad51 Foci Density Determination. Rad51 foci density was determined as described previously with minor modifications (Wang et al., 2001; Aloyz et al., 2002). At various time points after 1-h exposure to 20 μM CDDP treatment, the cells were washed with phosphate-buffered saline, fixed, and stained with a specific Rad51 rabbit antibody (H-92; Santa Cruz Biotechnology, Santa Cruz, CA). A fluorescein isothiocyanate-conjugated anti-rabbit immunoglobulin (Santa Cruz Biotechnology) was used as secondary antibody, and the nuclei were counterstained with propidium iodide (Sigma-Aldrich). 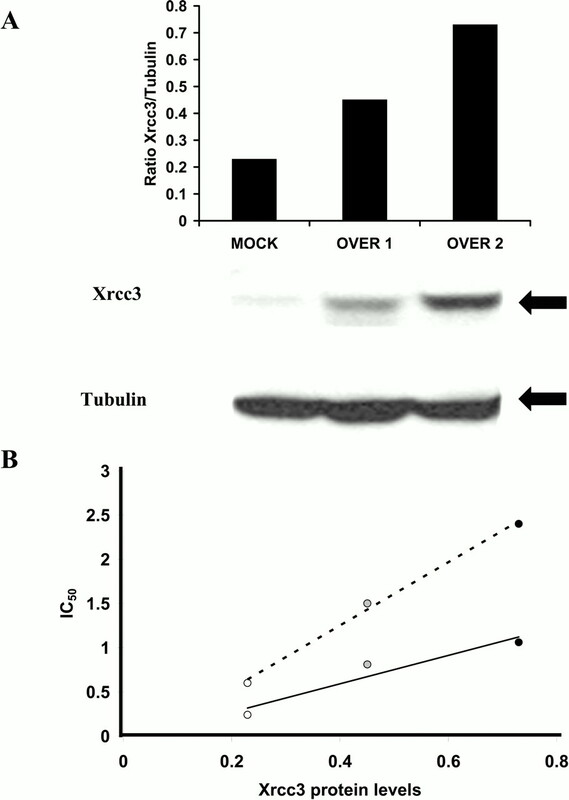 Xrcc3 constitutive overexpression was determined by Western blot analysis in 50 μg of protein extracts from MOCK cells and OVER cells (A). The cells were treated with cisplatin or melphalan 24 h after seeding. Cisplatin (dashed lines) and MLN (solid line) resistance determined by the SRB assay correlated with Xrcc3 protein levels (B). The y-axis represents the IC50 for the drugs, and the x-axis represents Xrcc3 protein levels. The open, gray, and black circles represent, respectively, the results obtained with MOCK, OVER1, and OVER2 cells, respectively. 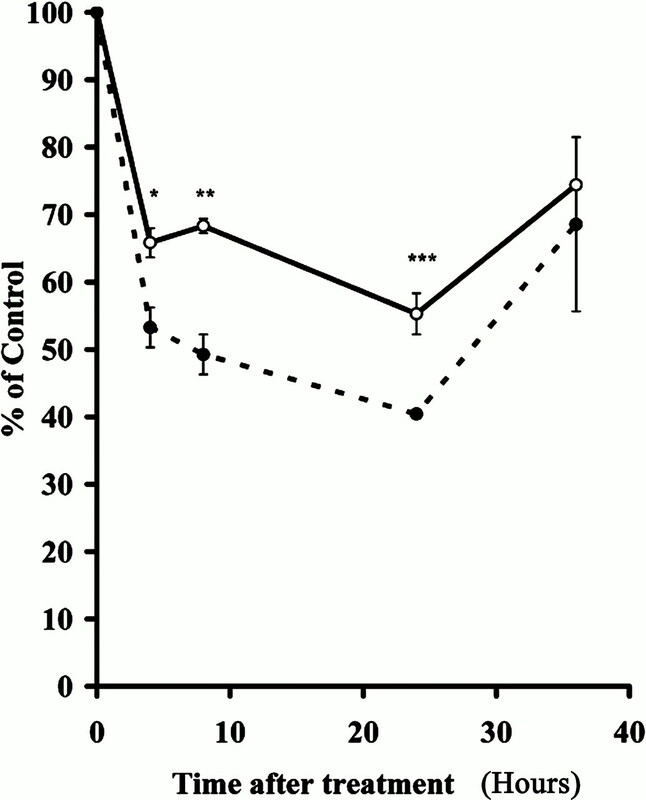 The resistance to CDDP (A) and MLN (B) was determined using the SRB assay 7 days after treatment. MOCK cells (open circles) and two clones of Xrcc3-overexpressing cells OVER1 (gray circles) and OVER2 (black circles) cells were treated with cisplatin or melphalan 24 h after seeding. The IC50 values in the tables (μM) represent the mean of three independent experiments ± 95% confidence intervals. The bottom panel is a representative survival assay used to obtain by interpolation the IC50 values. Changes in Rad51 nuclear density were determined by confocal microscopy as described before. The merged images with yellow staining represent the Rad51 nuclear localization. The total Rad51 foci density was determined as the ratio of the average yellow intensity (fluorescent total intensity) relative to the total yellow (fluorescent total area) stained area in five randomly selected fields or nuclei for each treatment. Sister Chromatid Exchanges (SCEs). Sister chromatid exchanges/cell were determined after treatment with cisplatin (0, 0.5, or 2.5 μM) as described before (Aloyz et al., 2002). Twenty-four hours after seeding, OVER and MOCK cells were treated with cisplatin. One hour after cisplatin treatment, fresh medium containing 0.04 μg of bromodeoxyuridine per milliliter (Roche Diagnostics, Indianapolis, IN) was added to the cultures for 44 h (two doubling times). During the final 5 h of culture, mitotic cells were arrested in metaphase with 0.01 μg/ml Colcemid (Invitrogen). Metaphase preparation was done by standard cytogenetic procedures. Differential sister chromatid staining was achieved by the fluorescence-plus-Giemsa method (Aloyz et al., 2002). Enumeration of SCEs was done without knowledge of treatment in 10-well spread second-division metaphases for each culture. Western Blot Analysis. Western blot analysis was performed using specific antibodies to α-Xrcc3 (1/1000 dilution; a kind gift of Dr. P. Sung, Howard Hughes Medical Institute, Department of Molecular Biology, Chevy Chase, MD), p53, p21 (1/2000 dilution; Lab Vision, Fremont, CA), phosphorylated Chk2 (Cell Signaling Technology Inc., Beverly, MA), extracellular signal-regulated kinase 2 (Santa Cruz), α-tubulin (1/10,000 dilution; Medicorp, Montreal, QC, Canada), Rad51C (1/1000 dilution; 7898; Abcam Ltd, Cambridge, UK), and Rad51B (1/500 dilution; a kind gift of Dr. Jean-Ives Masson, Laval University, Laval, QC, Canada) as described (Wang et al., 2001; Aloyz et al., 2002). , *, and ** indicate significant differences between MOCK and OVER cells. The respective p values are 0.042, 0.0016, and 0.045 (A). The bottom panel is the analysis of a representative FACS analysis of Annexin V positive cells (B). Cisplatin-Resistant DNA Synthesis. The cells were plated in six-well dishes and cultured for 2 days, until 70% confluence, in the presence of 15 μCi/ml [14C]thymidine to label total cellular DNA. Fresh medium with [14C]thymidine was used 24 h after initial plating. Following 2 days, the cells were treated with 10 μM CDDP or vehicle. One hour after treatment, the medium with cisplatin was removed, and drug-free media were added. At different times after cisplatin removal (2–36 h), fresh medium with 6 μCi/ml [3H]methylthymidine was added for 1 h. Following aspiration of the medium and two washes with ice-cold 5% trichloroacetic acid, the cells were solubilized in 0.3 N NaOH. An aliquot of neutralized (with glacial acetic acid) NaOH-solubilized material was added to a scintillation vial and the 3H and 14C radioactivity determined by dual channel liquid scintillation counting. The relative rates of DNA synthesis were determined by calculating the ratio of 3H/14C dpm. The rates of DNA synthesis were expressed as a percentage of control, i.e., the 3H/14C ratio in cells receiving vehicle treatment (Guo et al., 2002). Statistical Analysis. The results are expressed as the mean values ± 95% confidence intervals. Differences between mean values were assessed using the two-tailed, paired t test for means. Xrcc3 Mediates CDDP and MLN Resistance. Two Xrcc3-transfected MCF-7 clones, OVER1 and OVER2, overexpress Xrcc3 by 2- and 4-fold, respectively, when compared with mock-transfected cells (MOCK) (Fig. 1A). The resistance of CDDP and MLN in these cells correlates with Xrcc3 protein levels (r = 0.95) (Fig. 1B). 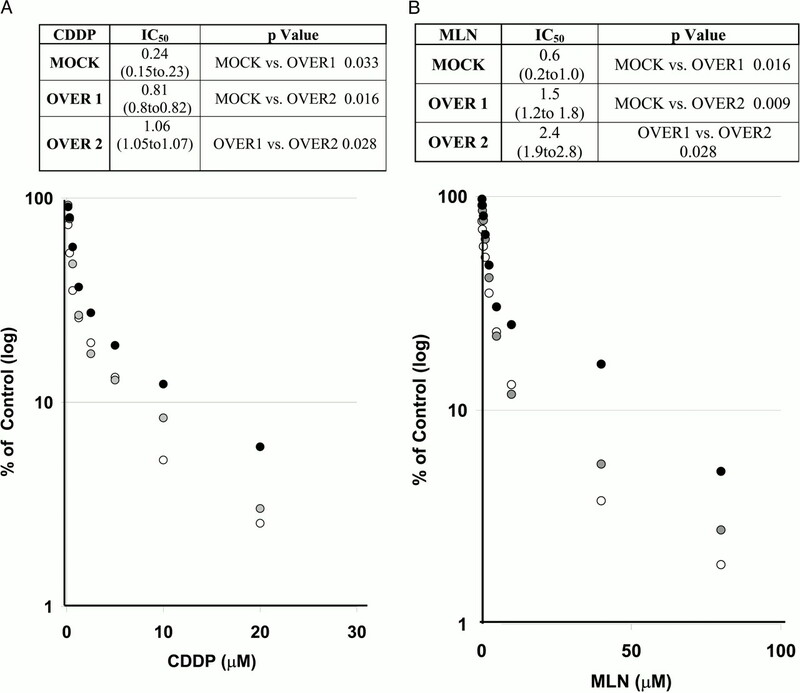 The Xrcc3-overexpressing clones displayed resistance to CDDP (OVER1, 3.4-fold; and OVER2, 4.4-fold) and MLN (OVER1, 2.5-fold; and OVER2, 4-fold) when compared with the MOCK cells (Fig. 2, A and B). The results suggest that Xrcc3 is an important factor in DNA cross-linking agent cytotoxicity since Xrcc3 protein expression correlates with increasing CDDP/MLN resistance. We wanted to determine next whether the differences in drug resistance between MOCK and OVER2 cells (OVER) are due to a difference in CDDP-induced programmed cell death. We assessed differences in Annexin V expression between MOCK and OVER cells after CDDP treatment. We used a 1-h 20 μM CDDP exposure, and we assessed differences in CDDP-induced apoptosis in a two-doubling time period (48 h). In this period of time, the IC50 determined by SRB (7 days after treatment) did not induce detectable apoptosis. We stained MOCK and OVER cells for Annexin V 0 to 36 h after CDDP treatment (Fig. 3). Our results show that CDDP induces some apoptosis in MOCK and OVER cells at ≥18 h after treatment. Significantly increased CDDP-induced apoptosis was observed in MOCK cells when compared with OVER cells 18, 24, and 36 h after CDDP. The majority of OVER cells were not apoptotic at 36 h.
Sister cultures of MOCK (open) and OVER (solid) cells were used to determine the effect of Xrcc3 overexpression on HRR as assessed by Rad51 foci determination after cisplatin treatment at 0 or 10 μM. Rad51 foci density (A). Rad51 density was expressed as (B) percentage of control per field (y-axis) versus time after treatment (x-axis) or (C) percentage of control per nucleus (y-axis) 12 h after cisplatin treatment. The values represents the mean of three independent experiments ± 95% confidence intervals; * and ** indicates significant difference p = 0.012 and 0.19 × 10–9, respectively. Xrcc3 Overexpression Affects the HRR Process. HRR occurs as a consequence of induced or spontaneous DNA damage and can be visualized by the appearance of Rad51 nuclear foci and SCEs (reviewed in Sonoda et al., 2001). Nevertheless, whereas Rad51 foci occur during the S-phase of the cell cycle, the SCEs are the reflection of postreplicational repair associated with crossing-over between sister duplexes (Sonoda et al., 1999). Because Xrcc3-null cells are hypersensitive to cisplatin and display deficient spontaneous or induced Rad51 foci and SCEs, we investigated the effect of Xrcc3 expression levels on Rad51 foci formation and SCEs before and after 10 μM CDDP treatment (Bishop et al., 1998; West, 2003). Rad51 foci nuclear density was similar in OVER and MOCK cells in basal conditions (data not shown). However, 12 h after treatment, when significant CDDP-induced apoptosis is not observed, drug-induced Rad51 foci density (Fig. 4), expressed either as density by field (Fig. 4B) or by nucleus (Fig. 4C), was increased by 2-fold in OVER cells with respect to MOCK cells. In contrast, there was no real difference in the percentage of increase of SCEs/cell induced by CDDP between OVER and MOCK cells (Fig. 5, A and B). However, surprisingly, Xrcc3 overexpression resulted in a 2-fold decrease in SCEs in the absence of induced DNA damage (Fig. 5, A and C). indicates significant difference, p = 0.003 and p = 0.00043 and 2.6 × 10–6, respectively. Xrcc3 Overexpression Alters the CDDP-Induced S-Phase Checkpoint. Xrcc3 overexpression did not affect the doubling time of MCF-7 cells (22 h), suggesting that although Xrcc3 expression is required for normal cell division, Xrcc3 overexpression does not alter this process in a Rad51-proficient background (Tebbs et al., 1995). Similarly, there were no significant differences between OVER and MOCK cells in the FACS profile in basal conditions (Fig. 6, left panel), suggesting that cell cycle progression is not affected by Xrcc3 overexpression in the absence of induced DNA damage. Early after CDDP treatment, there were no significant differences in cell cycle progression between MOCK and OVER cells. 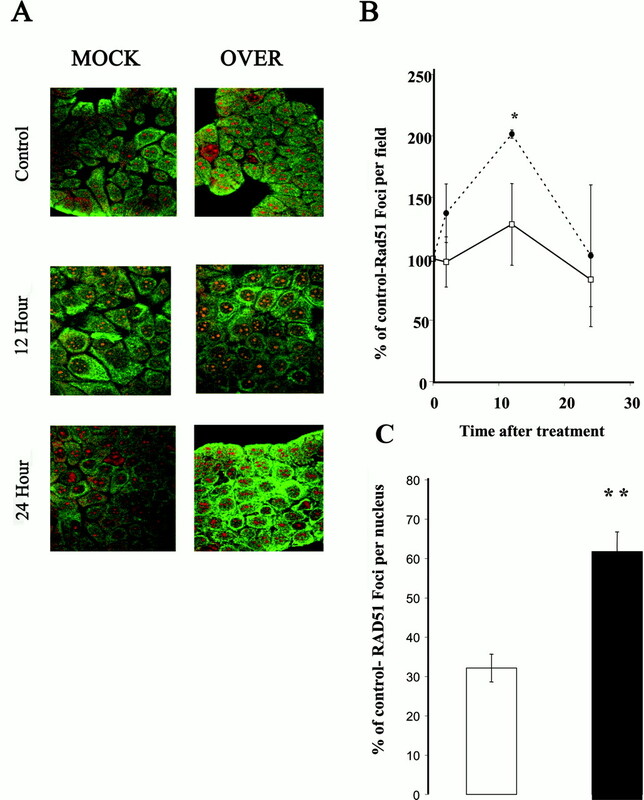 Six hours after CDDP treatment, MOCK and OVER cells undergo S-phase arrest (Fig. 6, middle panel). However, 12 h after treatment, a significantly higher percentage of OVER cells was arrested in S-phase when compared with MOCK cells (Fig. 6, right panel). Since S-phase checkpoint induction involves DNA synthesis arrest to allow DNA repair before the cells undergo mitosis (Cliby et al., 1998), CDDP-induced DNA synthesis arrest in OVER and MOCK cells after CDDP treatment was examined. There was no significant difference in DNA synthesis rate in the absence of CDDP treatment between the cell lines (data not shown). CDDP induced a transient DNA synthesis arrest (2–40 h) in both cell lines. However, the DNA synthesis arrest induced by CDDP was more pronounced in OVER than in MOCK cells (1.3- to 1.5-fold) (Fig. 7). Moreover, in keeping with the role of Chk2 in S-phase arrest, CDDP-induced Chk2 phosphorylation was more sustained in OVER cells (6–24 h) than in MOCK cells (6–12 h) (Fig. 8, A and B). 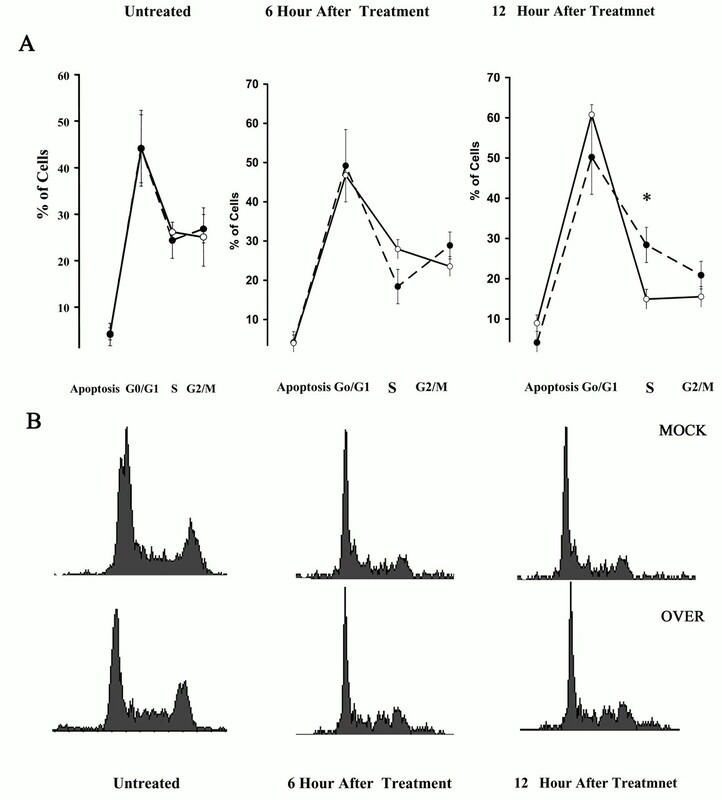 At a later time point (36 h), when Chk2 phosphorylation was decreased in both cell lines to basal levels, the percentage of OVER cells in S-phase was higher than in MOCK cells (Fig. 8C). Cell cycle progression was determined as described under Materials and Methods in sister cultures of MOCK (open) and OVER (solid) cells. The DNA content of untreated (left panel) or treated cells, 6 h (middle panel) and 12 h (right panel) after 20 μM cisplatin treatment was determined by FACS analysis after DNA labeling with propidium iodide. The values represent the mean of three independent experiments ± 95% confidence intervals. Asterisk indicates significant difference, p = 0.024 (A). Representative plots obtained by FACS analysis are reproduced in B.
p53 Protein Levels Correlates with Increased CDDP-Induced Apoptosis in Mock Cells. We did not find differences in the inductions of p53 and p21 between MOCK and OVER in p53 protein levels 6 to 24 h after CDDP treatment (Fig. 8, A and B). However, 48 h after treatment, p53 levels were close to basal values in OVER cells, whereas in MOCK cells p53 levels remained elevated (Fig. 8, A and B). Xrcc3 Protein Levels Correlate with Rad51C Protein Levels. Overexpression of Xrcc3 alters Rad51C protein levels. Increasing Xrcc3 protein levels correlate with Rad51C protein levels in the MOCK and OVER cell lines (Fig. 9), whereas Rad51B protein levels are not affected. This is consistent with the known protein-protein interaction of Xrcc3 and Rad51C (Masson et al., 2001). The increased Rad51C protein levels associated with overexpression of Xrcc3 are possibly secondary to altered protein stability. Different mechanisms are known to be involved in cisplatin resistance, including altered apoptosis by loss of p53 function, overexpression of bcl2, cytoplasmic inactivation, altered transport, or increased DNA repair (Siddik, 2002). Our results demonstrate that Xrcc3 overexpression in MCF-7 cells results in increased survival after cisplatin treatment associated with enhanced homologous recombinational DNA repair and consequently decreased cisplatin-induced apoptosis. These results are consistent with previous reports suggesting that in primary human tumor cells and human tumor epithelial cell lines, increased HRR is associated with interstrand cross-linking agent drug resistance (Batist et al., 1989; Torres-Garcia et al., 1989; Christodoulopoulos et al., 1999; Slupianek et al., 2001; Wang et al., 2001; Bello et al., 2002; Spanswick et al., 2002). However, Xrcc3 overexpression in a lymphoblastoid cell line did not increase mitomycin C resistance in preliminary results (Wiese et al., 2002). The divergent results may be due to a difference in the origin of the cell lines. The effect of Xrcc3 overexpression on cisplatin-induced DNA synthesis arrest was determined as described under Materials and Methods in sister cultures of MOCK (open) and OVER (solid) cells. Subconfluent cultures were plated in the presence of [14C]thymidine. Forty-eight hours later (70–80% confluence), the cells were treated for 1 h with 0 or 10 μM cisplatin. The DNA synthesis progression was assessed by a 1-h [3H]thymidine chase (x-axis; 0, 2, 6, 12, and 24 h after treatment). The values represent the mean of three independent experiments ± 95% confidence intervals; the asterisk indicates significant differences: *, p =0.0096, **, p = 0.0074, and ***, p = 0.0012. The increased percentage of Xrcc3-overexpressing cells arrested in S-phase 12 h after cisplatin treatment may be the reflection of increased HRR. Alternatively and/or additionally, it is also possible that the Xrcc3-mediated S-phase arrest after cisplatin treatment reflects the activation of a checkpoint response that alters Rad51-related HRR. The observation that CDDP-induced DNA synthesis arrest and Chk2 phosphorylation is more sustained in Xrcc3-overexpressing cells than in mock-transfected cells suggests that Rad51 HRR and S-phase checkpoint activation are intertwined. Our biochemical results are consistent with a scenario in which cisplatin-induced S-phase arrest in MCF-7 cells would be mediated by Chk2 phosphorylation. The sustained Chk2 phosphorylation observed in Xrcc3-overexpressing cells suggests that Xrcc3 is affecting the S-phase checkpoint pathway activated by ATM/ATR signaling pathways. Moreover, it has been reported that Xrcc3 may be involved in cell cycle progression since Xrcc3 modulates replication fork progression on cisplatin-damaged chromosomes via its role in homologous recombination (Henry-Mowatt et al., 2003). In MCF-7 cells, cisplatin-induced apoptosis is mediated by the induction of the tumor suppressor gene p53 (Lee et al., 1999). It has been shown that in breast cancer cell lines, cisplatin-induces S-phase arrest is independent of p53 status. Accordingly, Xrcc3 overexpression did not alter p53 or p21 protein levels up to 24 h after CDDP treatment. The late differences in p53 protein levels, 48 h following CDDP treatment, when the surviving cells are recovering from DNA synthesis arrest, may be secondary to a higher number of Xrcc3-overexpressing cells entering mitosis after a successful DNA repair, whereas mock-transfected cells undergo apoptosis. This hypothesis is sustained by the DNA-content profiles and the percentage of apoptotic cells observed 36 h after treatment. Since HHR takes place during S/G2M phases of the cell cycle, it is possible that the prolonged/increased S-phase checkpoint observed in Xrcc3-overexpressing cells is the reflection of increased cisplatin-induced DNA repair. This hypothesis is sustained by the fact that Xrcc3-overexpressing cells displayed increased Rad51 foci formation and survival after cisplatin treatment when compared with mock-transfected cells. Furthermore, we have not demonstrated that Xrcc3 is necessary for activation of the S-phase checkpoint in response to cisplatin. Also, it is possible that the effect on S-phase checkpoint after cisplatin treatment may be due in part to differences in the stress response to DNA damage in Xrcc3-overexpressing cells. Whether or not Xrcc3 is required for the S-phase checkpoint is not known. This question could be further assessed using specific Xrcc3-siRNA inhibitors. The effect of Xrcc3 in signaling proteins involved in cell cycle arrest and apoptosis was determined as described under Materials and Methods in protein extracts of MOCK and OVER cells by Western blot at different times after 20 μM CDDP treatment (A). 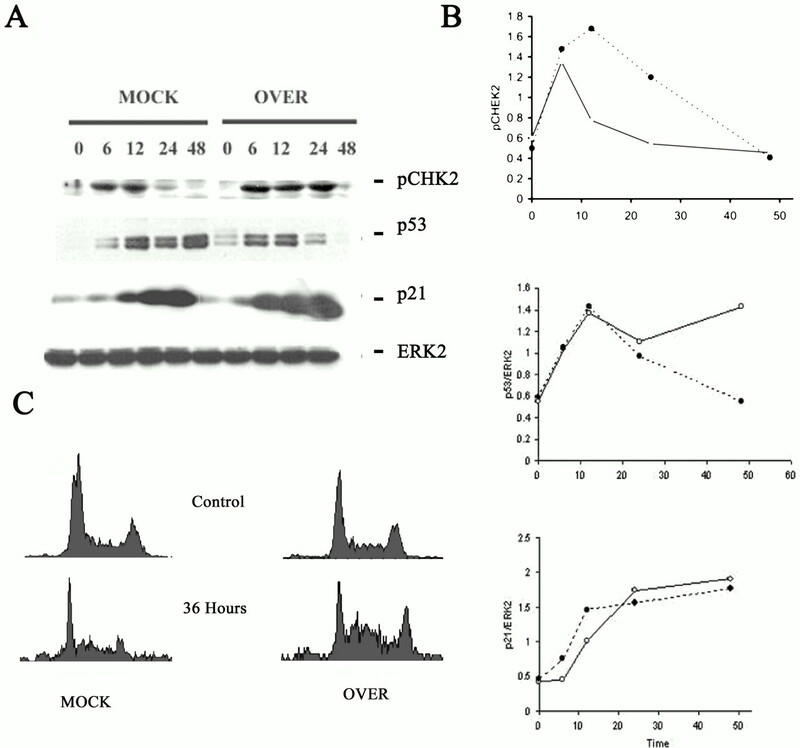 Changes in p53 and p21 protein levels relative to extracellular signal-regulated kinase 2 and Chk2 phosphorylation status (y-axis) after CDDP treatment (0–48 h; x-axis) are represented in the right panel (B). The results are a representative experiment of three independent determinations. Cell cycle progression was analyzed 36 h after treatment as described in Fig. 6 (C). The profiles are a representative experiment of two independent determinations. Increased Xrcc3 protein levels correlate specifically with an increased Rad51C protein level, suggesting that that Xrcc3 overexpression stabilizes Rad51C, presumably due to increased formation of the stabilizing Rad51C-Xrcc3 heterodimer (Masson et al., 2001). For example, it has been reported that a depletion of Rad51C protein in human cells causes a sharp reduction of Xrcc3 protein levels (Lio et al., 2004). Thus, Xrcc3 may indirectly modulate the HRR process via its interaction with Rad51C. 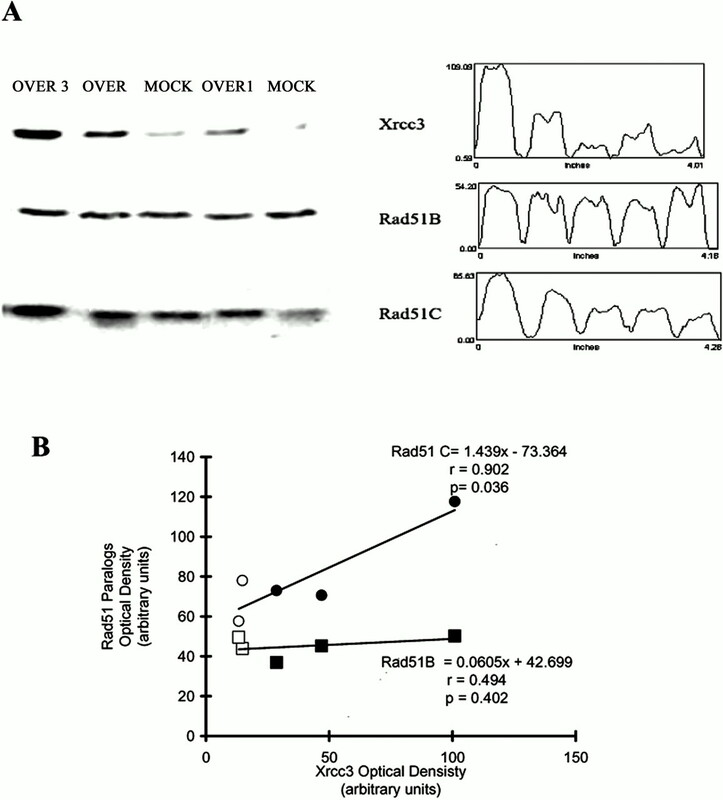 Previously, a modest increment in Rad51C was seen with Xrcc3 overexpression (Wiese et al., 2002). Moreover, it has been shown that disruption of Xrcc3-Rad51C and Rad51B-Rad51C interaction using a peptide corresponding to the amino acids 14 to 25 of RAD51C-sensitized hamster cells to cisplatin and reduced cisplatin-induced Rad51 foci (Connell et al., 2004). The differences observed in the effect of Xrcc3 expression levels on Rad51 foci formation (occurring during S-phase) and SCEs (postreplicative) may imply that these HRR-related processes involve different subpathways in which Xrcc3 plays different roles. In conclusion, our findings have clinical and biological implications. Xrcc3 may be useful as a marker of prognosis in the efficacy of DNA cross-linking agents in the treatment of human tumors. From the biological point of view, the results suggest the existence of crosstalk between HRR and the S-phase checkpoint machinery. Protein extracts from MOCK cells (open symbols) and OVER cells (solid symbols) were separated by 12% SDS-polyacrylamide gel electrophoresis. The proteins were transferred to a nitrocellulose membrane and probed sequentially with specific antibodies against Xrcc3, Rad51B, and Rad51C (A, left panel). The signals in each lane were analyzed using the Scion Image software (A, right panel; Scion Corporation, Frederick, MD). The Xrcc3 optical density (x-axis) correlates with Rad51C optical density (circles) but not with Rad51B optical density (squares). The linear regression analysis between the optical densities was obtained using the Microsoft Excel Statistical Tool Pack (B; Microsoft, Redmond, WA). The results indicate that there is a significant linear correlation (p = 0.036, r = 0.902) between Xrcc3 and Rad51C expression. Supported by a National Cancer Institute Cancer Research Society (Toronto, ON, Canada) grant and a generous private donation from the Helen and Nicky Rosenbloom Lang Scholarship to L.P., a U.S. Army grant and a Lymphoma Foundation of Canada fellowship to R.A., and a Leukemia Lymphoma Fund of Canada Fellowship to Z.-Y.X. ABBREVIATIONS: ICL, interstrand crosslink(s); HRR, homologous recombinational repair; IR, ionizing radiation; ATM, ataxia telangiectasia-mutated homolog; ATR, ataxia telangiectasia-mutated and Rad3-related; CDDP, cisplatin; MLN, melphalan; SRB, sulforhodamine B; CI, confidence interval; FACS, fluorescence-activated cell sorting; SCE, sister chromatid exchange(s); MOCK, mock-transfected cells; OVER, Xrcc3-overexpressing cells. Aloyz R, Grzywacz K, Xu ZY Loignon M, Alaoui-Jamali MA, and Panasci L (2004) Imatinib sensitized CLL lymphocytes to chlorambucil. Leukemia 18: 409–414. Aloyz R, Xu ZY, Bello V, Bergeron J, Han FY, Yan Y, Malapetsa A, Alaoui-Jamali MA, Duncan AM, and Panasci L (2002) Regulation of cisplatin resistance and homologous recombinational repair by the TFIIH subunit XPD. Cancer Res 62: 5457–5462. Batist G, Torres-Garcia S, Demuys JM, Greene D, Lehnert S, Rochon M, and Panasci L (1989) Enhanced DNA cross-link removal: the apparent mechanism of resistance in a clinically relevant melphalan-resistant human breast cancer cell line. Mol Pharmacol 36: 224–230. Bello VE, Aloyz RS, Christodoulopoulos G, and Panasci L (2002) Homologous recombinational repair is-a-vis chlorambucil resistance in chronic lymphocytic leukemia. Biochem Pharmacol 63: 1585–1588. Bishop DK, Ear U, Bhattacharyya A, Calderone C, Beckett M, Weichselbaum RR, and Shinohara A (1998) Xrcc3 is required for assembly of Rad51 complexes in vivo. J Biol Chem 273: 21482–21488. Christodoulopoulos G, Malapetsa A, Schipper H, Golub E, Radding C, and Panasci LC (1999) Chlorambucil induction of HsRad51 in B-cell chronic lymphocytic leukemia. Clin Cancer Res 5: 2178–2184. Cliby WA, Roberts CJ, Cimprich KA, Stringer CM, Lamb JR, Schreiber SL, and Friend SH (1998) Overexpression of a kinase-inactive ATR protein causes sensitivity to DNA-damaging agents and defects in cell cycle checkpoints. EMBO (Eur Mol Biol Organ) J 17: 159–169. Connell PP, Siddiqui N, Hoffman S, Kuang A, Khatipov EA, Weichselbaum RR, and Bishop DK (2004) A hot spot for RAD51C interactions revealed by a peptide that sensitizes cells to cisplatin. Cancer Res 64: 3002–3005. De Silva IU, McHugh PJ, Clingen PH, and Hartley JA (2000) Defining the roles of nucleotide excision repair and recombination in the repair of DNA interstrand cross-links in mammalian cells. Mol Cell Biol 21: 7980–7990. Falck J, Petrini JH, Williams BR, Lukas J, and Bartel J (2002) The DNA damage-dependent intra-S phase checkpoint is regulated by parallel pathways. Nat Genet 30: 290–294. Guo N, Faller DV, and Vaziri C (2002) Carcinogen-induced S-phase arrest is Chk1 mediated and caffeine sensitive. Cell Growth Differ 13: 77–86. Henry-Mowatt J, Jackson D, Masson JY, Johnson PA, Clements PM, Benson FE, Thompson LH, Takeda S, West SC, and Caldecott KW (2003) Xrcc3 and Rad51 modulate replication fork progression on damaged vertebrate chromosomes. Mol Cell 11: 1109–1117. Lee SI, Brown MK, and Eastman A (1999) Comparison of the efficacy of 7-hydroxy-staurosporine (UCN-01) and other staurosporine analogs to abrogate cisplatin-induced cell cycle arrest in human breast cancer cell lines. Biochem Pharmacol 58: 1713–1721. Lio Y-C, Schild D, Brenneman MA, Redpath JL, and Chen DJ (2004) Human Rad51C deficiency destabilizes Xrcc3, impairs recombination and radiosensitizes S/G2-phase cells. J Biol Chem 279: 42313–42320. Liu N, Lamerdin JE, Tebbs RS, Schild D, Tucker JD, Shen MR, Brookman KW, Siciliano MJ, Walter CA, Fan W, et al. (1998) XRCC2 and Xrcc3, new human Rad51-family members, promote chromosome stability and protect against DNA cross-links and other damages. Mol Cell 1: 783–793. Liu Y, Masson JY, Shaha R, O'Regan P, and West S (2004) RAD51C is required for Holliday junction processing in mammalian cells. Science (Wash DC) 303: 243–246. Masson JY, Tarsounas MC, Stasiak AZ, Stasiak A, Shah R, McIlwraith MJ, Benson FE, and West SC (2001) Identification and purification of two distinct complexes containing the five RAD51 paralogs. Genes Dev 15: 296–307. McHugh PJ, Spanswick VJ, and Hartley JA (2001) Repair of DNA interstrand crosslinks: molecular mechanisms and clinical relevance. Lancet Oncol 8: 483–490. Siddik ZH (2002) Biochemical and molecular mechanisms of cisplatin resistance. Cancer Treat Res 112: 263–284. Slupianek A, Schmutte C, Tombline G, Nieborowska-Skorska M, Hoser G, Nowicki MO, Pierce AJ, Fishel R, and Skorski T (2001) BCR/ABL regulates mammalian RecA homologs, resulting in drug resistance. Mol Cell 8: 795–806. Sonoda E, Sasaki MS, Morrison C, Yamaguchi-Iwai Y, Takata M, and Takeda S (1999) Sister chromatid exchanges are mediated by homologous recombination in vertebrate cells. Mol Cell Biol 19: 5166–5169. Sonoda E, Takata M, Yamashita YM, Morrison C, and Takeda S (2001) Homologous DNA recombination in vertebrate cells. Proc Natl Acad Sci USA 98: 8388–8394. Spanswick VJ, Craddock C, Sekhar M, Mahendra P, Shankaranarayana P, Hughes R, Hochhauser D, and Hartley JA (2002) Repair of DNA interstrand crosslinks as a mechanism of clinical resistance to melphalan in multiple myeloma. Blood 100: 224–229. Takata M, Sasaki MS, Tachiiri S, Fukushima T, Sonoda E, Schild D, Thompson LH, and Takeda S (2001) Chromosome instability and defective recombinational repair in knockout mutants of the five Rad51 paralogs. Mol Cell Biol 21: 2858–2866. Tebbs RS, Zhao Y, Tucker JD, Scheerer JB, Siciliano MJ, Hwang M, Liu N, Legerski RJ, and Thompson LH (1995) Correction of chromosomal instability and sensitivity to diverse mutagens by a cloned cDNA of the Xrcc3 DNA repair gene. Proc Natl Acad Sci USA 92: 6354–6358. Torres-Garcia SJ, Cousineau L, Caplan S, and Panasci L (1989) Correlation of resistance to nitrogen mustards in chronic lymphocytic leukemia with enhanced removal of melphalan-induced DNA cross-links. Biochem Pharmacol 38: 3122–3123. Wang ZM, Chen ZP, Xu ZY, Christodoulopoulos G, Bello V, Mohr G, Aloyz R, and Panasci LC (2001) In vitro evidence for homologous recombinational repair in resistance to melphalan. J Natl Cancer Inst 93: 1473–1478. 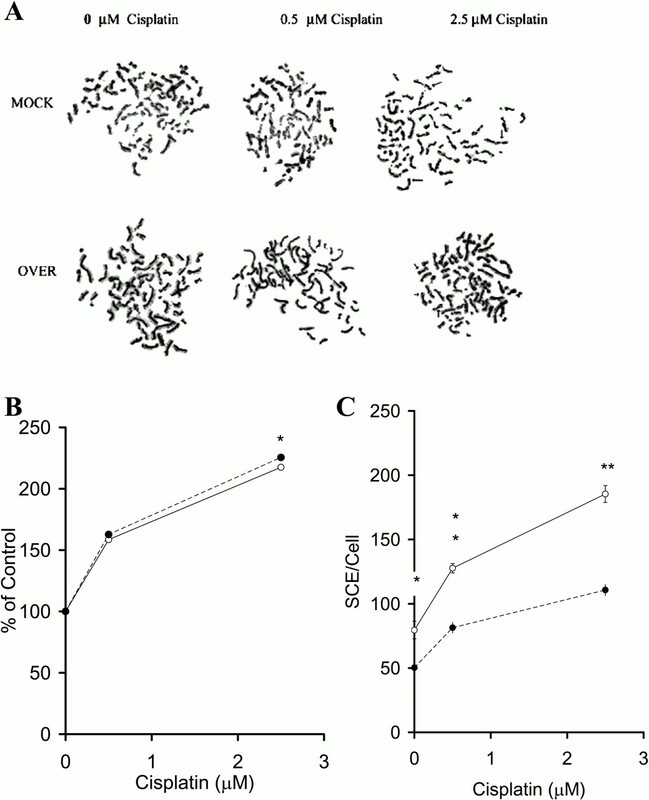 West SC (2003) Molecular views of recombination proteins and their control. Nat Rev Mol Cell Biol 435: 435–445. Wiese C, Collins DW, Albala JS, Thompson LH, Kronenberg A, and Schild D (2002) Interactions involving the Rad51 paralogs Rad51C and Xrcc3 in human cells. Nucleic Acids Res 30: 1001–1008. Yoshihara T, Ishida M, Kinomura A, Katsura M, Tsuruga T, Tashiro S, Asahara T, and Miyagawa K (2004) Xrcc3 deficiency results in a defect in recombination and increased endoreduplication in human cells. EMBO (Eur Mol Biol Organ) J 23: 670–680.